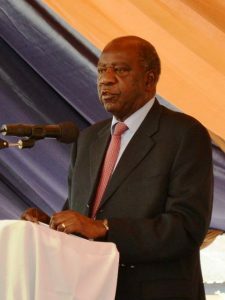 Finance Minister Alexander Chikwanda says the current economic challenges facing Zambia are not unusual. Mr Chikwanda said this is not the first time that Zambia is undergoing economic challenges caused purely by external forces. Mr Chikwanda said the dip in the economy is a normal cycle in any economic which should not be over dramatised. He said the slowdown in the Chinese economy is mainly responsible for the weakening of the Kwacha as copper receipts have drastically reduced. The Finance Minister was speaking in Lusaka on Thursday when he delivered a key note address at the 2015 Zambia Finance and Investment Conference organised by Euromoney Conferences at the Taj Pamodzi Hotel. Mr Chikwanda said although some people want to portray a picture as if the government is solely to blame for the current economic woes, every genuine economist knew that there will come a time when the Chinese economy will begin to slowdown. “Surely nobody expected China to continue growing at the same level, there was going to be a time when they would finish constructing their roads, office buildings and any other infrastructure and reduce their appetite for our copper and maybe that time has now come,” Mr Chikwanda said. He said the Zambian economy is resilient enough to withstand the current economic storm. Mr Chikwanda said government has taken a raft of measures to stabilise the macroeconomic environment which is necessary for sustainable growth. He said government is focused on reducing the budget deficit to manageable levels as a free of freeing up capital for private sector lending. “We are going to rein in on public expenditure this year and going forward as a way of managing our cash flow position, but most of these measures have to be taken before cabinet first, i normally do not like to pre-empt these tins before we debate them as cabinet but we are formulating something,” he said. On the foreign exchange position, Mr Chikwanda said the Kwacha depreciation has been compounded by the speculators who are trying to cash in on the situation. Chikwanda opens his mouth and sends panic all around. His admitting sitting on under 3 months import reserves in itself is a panic alarm. He shall be fired. There are many good economists around, or still better bring a banker from England to sort out unbridled spending on globe trotting, unbudgeted projects and so on. Expatriate BOZ governor will refuse to allow overdraft to the government. Still better Minister of finance shall also come from England. Ivivi vi midala nichani kanshi? How come it’s only when you are finance minister that the chinese blabla, we chimudala chabula insoni we. Who can listen to your old age stupidity? Way back when you were finance minister, we lost touch with the dollar such that we queued for basics like sugar, mealiemeal, soap etc. Now, again we have missed the dollar and we don’t have spendable income for mealiemeal, sugar and more. What are you talking about you numskull? Kwacha on freefall journey? K10 to one dollar today. Hail the Finance Minister. How can Chikwanda say there is nothing unusual about Zambia’s economy? Has the dollar ever reached K10 since independence? Batata kwena nabalanda tumo utwachishinka. Am sure he is innocent coz he did not choose himself and responsible people can not relieve him of his duty. The one keeping him there is responsible for all economic problems. Unplanned expenditure is what surprises Chikwanda as well. Chikwanda is defending himself and telling us who is responsible. The pf has lamentably failed and I wonder where they get courage to talk about winning an election. But the chikwandanomics are most welcome to teach ba kopala and Lusaka the meaning of the pf slogan “don’t kubeba”. Actually we are reaping the don’t kubeba fruits. Fire Chikwanda and control government expenditure. President sir, stop travelling with big entourage and still better Stop completely. Live within means, do not pretend to be rich when you are not. Discipline and sacrifice begins from top. Make yourself a role model. Reduce cabinet size, let one minister do the job of two-three ministers. Let them work instead of lecturing,drinking and travelling all the time. Stop the rot. Set an example before it is too late. I can safely say, if you do not act now, you will not only lose elections, the results will be dire for Zambia. Bemba economics at its best. Don’t trust these people. They are just good at yapping and stealing.